Late one night, not too long after my father had passed away, I was driving home while praying and talking to my dad… suddenly out of the corner of my eye I saw what I thought were angel wings. I felt compelled to turn the car around while I questioned my own sanity. Was I just seeing things? 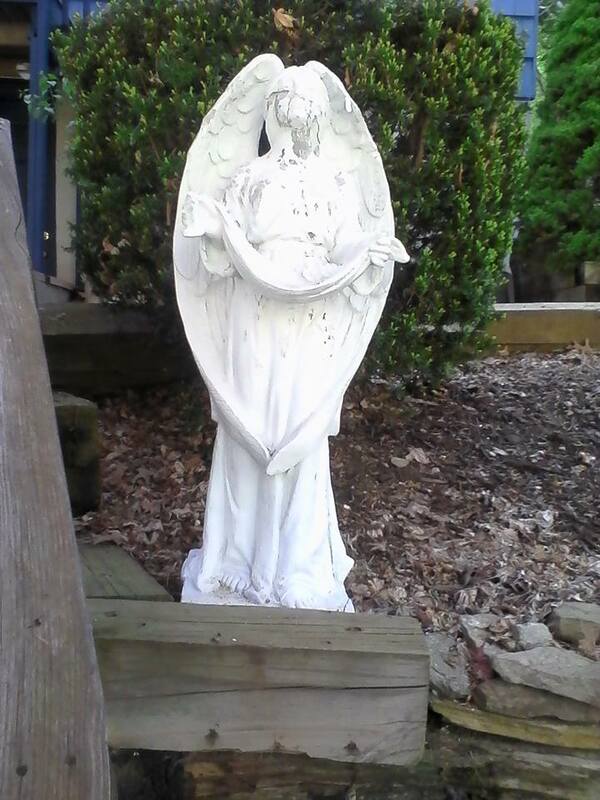 There at the curb sat a large, yet beautiful, faceless angel someone had put out for the trash collection. I was taken aback by the timing of it all and by the expanse of the angel’s wings that curved in around the front of her knees. I lifted the heavy angel and placed her lovingly into the passenger seat for the long ride home. It was dark that night and it wasn’t until the following day, in the sunlight, that I realized just how damaged, and even eerie, the angel’s face was. Convinced this find was a gift from my dad, I ran to the nearest store to grab some cheap putty and some white spray paint. I placed the angel on the wooden steps in front of our house and began to use the putty to build up what once had been, eyes, a nose and cheekbones. I’m sure you’ve heard the expression, “Only God can make a tree.” Let me tell you, I say, only God can make a human face. The difficulty lies in the expression. This angel’s face could surely come out strange-looking, creepy or just plain scary… I thought, as my fingers maneuvered the putty. My son, Rocky had just gotten off the school bus and walked up the driveway. “Mom, what are you doing?” He asked. “I’m trying to make a face for this angel I found. I want to put it in our yard as a tribute to Grandpa Ed.” I replied. The next thing I knew, Rocky had dropped his book bag and had both of his hands on the angel’s face, right next to my hands. Together both of our fingers built up the cheek bones and smoothed over the lips until she was finished. I let the angel’s new face dry in the sun, as Rocky and I stood staring at her and our work. “It looks great mom!” Rocky said. “It does!” I replied with a tear in my eye. I sprayed the angel with several coats of spray paint. Then I placed her gently in the yard and sprinkled fresh wood chips at her feet. My father always loved to feed the birds, so for the finishing touch, I filled the material she was holding with birdseed. I think my dad would be proud. And every time I look at her it reminds me that although my dad is no longer here, he’s always watching over us. Just lovely! What a wonderful tribute to your Dad. That beautiful angel will be feeding the birds who soar toward heaven, as well. Awww, thank you! That means a lot! I love that the angel is even more special because you and Rocky recreated it in honor of your Dad together while thinking of him – what a truly beautiful story. I believe the angel did come right from your Dad! The entire occurrence of events lead me to believe that! Thank you and thank you for following my blog! I speak from my heart. Thank you again. I’m going for it! You and Rocky should be plastic surgeons. The face is beautiful! Stay strong and don't forget to laugh!